Cancer is more common than flu in the Iraqi city of Najaf, about 160 km south of Baghdad, one local doctor told RT. After the start of the war rates of leukemia and birth defects “rose dramatically” due to use of depleted uranium by the US military. “Every single residential street that we’ve visited in several neighborhoods, we found multiple cases of families whose children were ill, families who had lost children who had to bury children, families who had many relatives who were suffering from cancer,” RT correspondent Lucy Kafanov said. Dr. Chris Busby has researched the effects of depleted uranium in detail. He says the only source of uranium in Iraq was the use by the American-led forces of uranium weapons. “We went to Fallujah and we found the levels of cancer. We looked at the parents of children with congenital malformation and we did analysis of their hair to see what was inside their hair that might be genotoxic, that might be the sort of thing that can cause congenital malformation. The only thing that we found was uranium. We found uranium in the mothers of the children with congenital malformations,” he told RT. 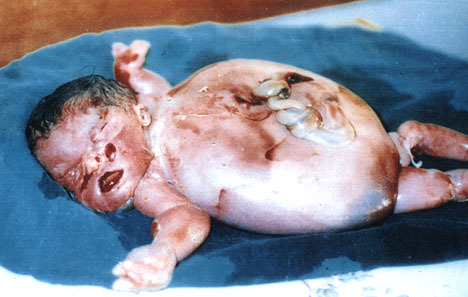 From 2009 onwards, credible media reports from the city of Fallujah, which had been the scene of intense urban warfare in 2004, brought reports of high rates of congenital birth defects in the city to the world’s attention. At least two platforms that utilize DU munitions were employed in ‘Phantom Fury’, the most intense operation since the official end of major combat operations in 2003. At least 440,000kg of DU was used in Iraq, some ending up as DU dust, some as corroding penetrators and leaving a still unknown number of sites with contaminated vehicles, buildings and soils, according to a Dutch report. “The exposure risks to civilians from the use of DU in populated areas have been compounded by the US’s persistent refusal to release the data that could have helped facilitate the effective assessment and clearance work, providing that the Iraqi government had the capacity and finances to undertake it. Taken as a whole, these issues cast serious doubts over the legitimacy of the use of DU,” the Dutch report says. Aside from DU’s potential impact on physical health, it is highly likely that its use and presence in Iraq has led to heightened fear and anxiety, which in turn may have created a measureable psycho-social impact, the authors of the report note. Another report, funded by the Norwegian government, has recently found that depleted uranium was used against civilian targets in populated areas in Iraq, in 2003. It emphasizes a lack of transparency by coalition forces over the use of depleted uranium, but also describes one incident in Najaf where a Bradley armored fighting vehicle fired 305 depleted uranium rounds in a single engagement. “We know that uranium is genotoxic, that it causes these levels of genetic damage, and because of that it also causes cancer. The only source of uranium was the use by the American-led forces of uranium weapons. Not only depleted uranium weapons, but as we later found out slightly enriched uranium weapons, which we believe they were using in order to cover their tracks. So, I think we have more or less proved that these effects are a result of the use during the two wars of uranium, and the particles that the uranium weapons produced,” Dr. Busby explained. Depleted uranium weapons are known for the ability to penetrate through walls and tanks. One of its most dangerous “side effects” is that when the substance vaporizes, it generates dust inhaled by individuals. “After the start of the Iraq war, rates of cancer, leukemia and birth defects rose dramatically in Najaf. The areas affected by American attacks saw the biggest increases. We believe it’s because of the’ illegal’ weapons like depleted uranium that were used by the Americans. When you visit the hospital here you see that cancer is more common than the flu,” Dr. Sundus Nsaif told RT. The Pentagon and the UN estimate that US and British forces used 1,100 to 2,200 tons of armor-piercing shells made of depleted uranium during attacks in Iraq in March and April, far more than the [officially] estimated 375 tons used in the 1991 Gulf War, according to a report published in Seattle Post-Intelligencer in 2003. In cities like Basra and Fallujah, where American and British forces used heavy munitions at the start of the war, it is estimated that over half of all babies conceived after the start of the war were born with heart defects. According to a study published in the Bulletin of Environmental Contamination and Toxicology, between October 1994 and October 1995 the number of birth defects per 1,000 live births in Al Basrah Maternity Hospital was 1.37. In 2003, the number of birth defects in the same hospital was 23 per 1,000 livebirths. Within less than a decade, the occurrence of congenital birth defects increased 17-fold. The international community has voiced concerns over the actual effects of the use of such weapons. World Health Organization (WHO) and the Ministry of Health (MOH) in Iraq are expected to publish a report on this in the near future. But so far it has been delayed. According to WHO, the report will not examine the link between the prevalence of birth defects and use of depleted uranium (DU) munitions used during the war and occupation in Iraq. “Since the issue of associating congenital birth defects with exposure to depleted uranium has not been included in the scope of this particular study, establishing a link between the congenital birth defects prevalence and exposure to depleted uranium would require further research,” WHO states. “There haven’t been large-scale studies done. We haven’t seen big teams of international doctors, for example, going in and looking at different cities, comparing the number of birth defect cases between the different cities. There are really no reliable statistics for birth defects in Iraq, so nobody can really say exactly how big this problem is,” Kafanov says. She witnessed a complete disregard by the authorities to the sufferings of the local residents. Few sites have been formally identified by the Iraqi authorities as being contaminated by DU, even though two contaminated tanks were found in 2005, according to a Dutch report. Meanwhile, doctors on the ground are discouraged from talking out openly about the issue to the press.